"Using software to create ceramics and design furniture, New York-based studio Commonwealth has made a name for itself in employing familiar technological processes in unlikely ways (see CR August 07). Its latest project, 'Fleshless', is very much a case in point - a flooring system designed using a programme more commonly used to create liquids in movie special effects sequences. "Fleshless began as a thick, gaseous form generated within a fluid dynamic simulation software," explains Zoe Boira Coombes, Commonwealth's Co-founder. In order to transform this three-dimensional image from monitor to solid floor "the thickness of the model needed to be compressed to a near-plane, with a surface variation of no more than 6mm in depth" over its area. "Basically, we had to remove all the 'flesh' so it became more like a thin skin, hence the name." This flattened, bubbly surface model was milled into plywood to expose the multiple layers within the wooden sheets and divided into a grid of tiles. A furniture finisher then stained the surface a glossy, translucent white and floor was installed at Espeis Gallery, the studio's gallery in New York. "There is a slight relief to the floor and it feels amazing to the touch," says Boira Coombes of the finished work. "We were quite happy to see everything come through to the surface like an iridescent skin. 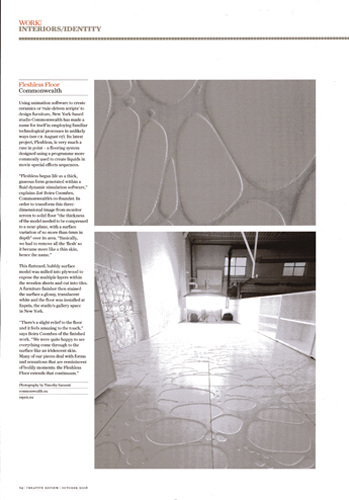 Many of our pieces deal with forms and sensations that are reminiscent of bodily moments: the Fleshless floor extends that continuum"
- Mark Sinclair for Creative Review Magazine.